The new PC version of the world-renowned RollerCoaster Tycoon franchise is packed with exciting fan-favorite features and next-generation building and simulation elements – including a 3D spline-based coaster builder and robust user-generated content experience. The pre-order program starts today for a limited time. By pre-ordering now, fans will be able to play RollerCoaster Tycoon World before the official launch date with access to two exclusive beta programs. Fans will also be offered the unique opportunity to provide feedback and comments and contribute to the development of the game. RollerCoaster Tycoon World can be pre-ordered on the official site or on the Steam page. In addition, each pre-order package includes five unique peep skins! Developed by Nvizzio Creations, RollerCoaster Tycoon World is based on real-life theme park schematics, ride physics, and guest traffic patterns. Six Flags Entertainment, the world’s largest regional theme park company, provided the technical expertise and inspiration to help create the most realistic theme park simulation experience ever. Powerful Building Tools: All new genre-redefining tools allow for freeform object placement, curved paths, innovative 3D track editor, and fully deformable terrain with water. A robust selection of in-game objects includes pre-made rides, coasters, scenery and shops. Expansive Customization Support: Play on multiple maps with various themes. Plus, for the first time in the history of the franchise, RollerCoaster Tycoon World integrates with Steam Workshop to introduce native user-generated content tools. Fully Realized Next-Generation Simulation: Detailed Park Management Tools, Multiple Game Modes, Responsive Environments and Guests, Advanced Physics, Innovative Services as well as the ability to ride every coaster in the game makes RCTW one of the most advanced simulation tycoon games ever! Native Sharing and Social Features: From social media integration to native Steam Workshop support, you’ll be able to seamlessly share your creations with the world. 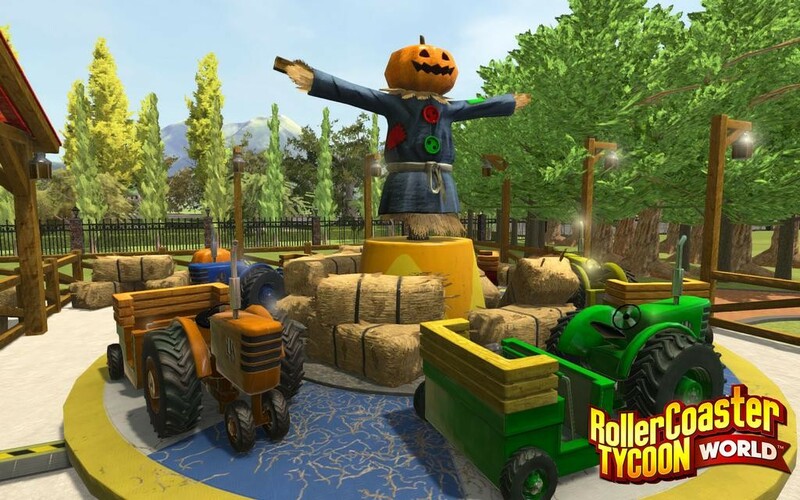 For the latest news on RollerCoaster Tycoon World, sign up for updates and read the devs’ blogs at RollerCoasterTycoon.com and join the Forum. Fans can also join the conversation by liking RollerCoaster Tycoon World on Facebook, and following RollerCoaster Tycoon World on Twitter at OfficialRCT. This entry was posted on Tuesday, September 29th, 2015 at 7:21 pm by CoffeeScamp and is filed under News. You can follow any responses to this entry through the RSS 2.0 feed. You can leave a response, or trackback from your own site.